The GOES-S satellite will take the place of NOAA's current GOES-West spacecraft to monitor the western U.S. Its view will extend all the way to New Zealand, as well. NASA and the National Oceanic and Atmospheric Administration (NOAA) will launch the second next-generation weather satellite of the high-tech GOES-R satellite series on March 1, 2018. GOES-S (Geostationary Operational Environmental Satellite-S) is scheduled to launch from Cape Canaveral Air Force Station in Florida at at 5:01 p.m. EST (2202) on a United Launch Alliance Atlas V rocket. When GOES-S reaches its geostationary orbit, it will be renamed GOES-17. It is scheduled to take over for the GOES-15 satellite and become GOES-West once it becomes fully operational in late 2018. A United Launch Alliance Atlas V rocket carrying the GOES-S weather satellite soars toward space during a successful launch from Cape Canaveral Air Force Station on March 1, 2018. 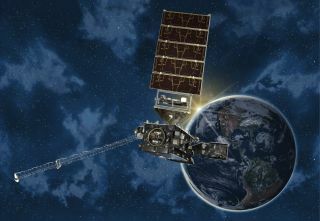 NOAA's GOES-S satellite launched March 1 on ULA's Atlas V rocket from Cape Canaveral Air Force Station in Florida. The advanced weather satellite will give researchers and meteorologists unparalleled views of the U.S. West. The GOES-East and GOES-West satellites cover the Western Hemisphere. The GOES-R series satellites — made up of the GOES-R, GOES-S, GOES-T and GOES-U — will improve the detection and observation of environmental phenomena affecting public safety, protection of property and the nation's economic health and prosperity. The GOES-S satellite undergoes a thermal vacuum chamber test of its ability to function in the cold void in space. GOES-S will orbit 22,300 miles (36,000 kilometers) above the Earth. The GOES-S satellite is loaded into a U.S. Air Force C-5M super Galaxy cargo aircraft at Buckley Air Force Base in Aurora, Colorade. The satellite was then flown to Kennedy Space Center in Florida and transported to the Astrotech Space Operations facility in Titusville. On Dec. 4, 2017, the GOES-S arrived at NASA's Kennedy Space Center in Florida on a U.S. Air Force C-5M Super Galaxy cargo jet. The GEOS-S satellite was prepped for launch inside the Astrotech Space Operations in Titusville, Florida. After being transported to the Astrotech Space Operations facility, the GOES-S satellite was housed in a clean room. A Mariner transport ship delivered the components of the United Launch Alliance Atlas V rocket to the Army Wharf at Cape Canaveral Air Force Station. The ULA Atlas V booster is offloaded at Cape Canaveral Air Force Station.